It is not often that a new Ogham stone is discovered, so when last week someone asked me to take a look at a piece of slate with a possible Ogham inscription on it that they had just found, I was excited, but not overly hopeful that it would turn out to be a genuine Ogham inscription. I frequently get people sending me pictures of various artefacts to identify, and nine times out of ten the object is not what they expected. 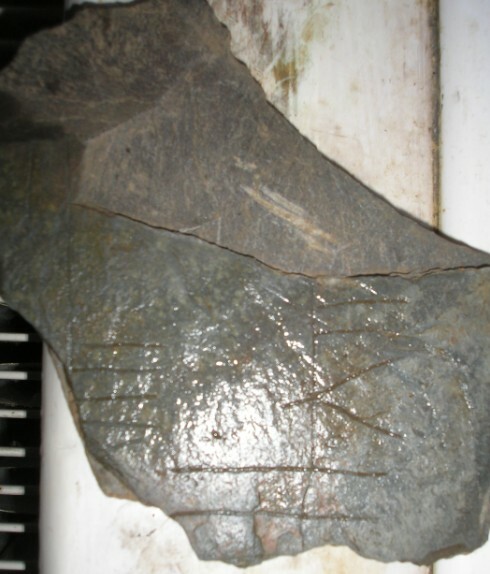 And in this case, it would have been so easy for someone to have optimistically mistaken random scratches or natural marks on a stone for the strokes of Ogham letters. However, as soon as I saw the stone in question I felt certain that this was indeed a fragment of a genuine Ogham-inscribed stone, and a thing of great rarity. The stone was found by an anonymous but responsible metal detectorist (who immediately reported the find to the appropriate archaeological authorities) on the day of Guy Fawkes Night in a ploughed field near a church somewhere on the Penwith peninsula in the far west of Cornwall. The exact location of the find is not being revealed for the time being, so the tag on the map below is only very approximately placed. 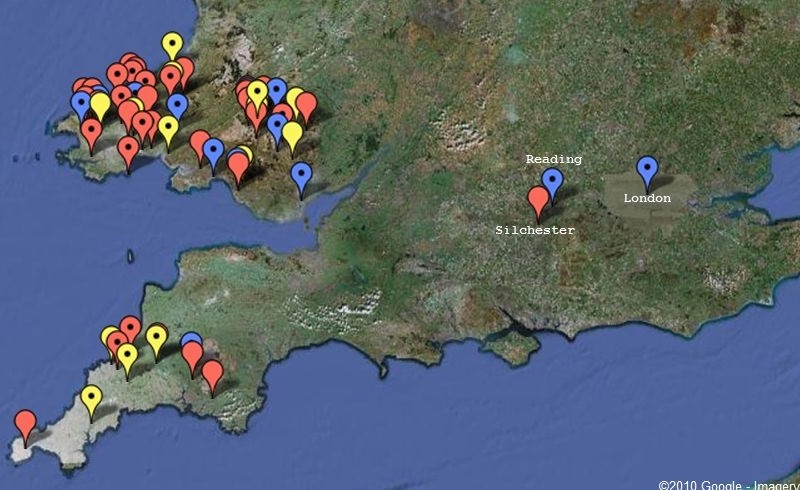 As can be seen from the map (where red tags mark certain Ogham inscriptions, and yellow tags mark dubious or unconfirmed Ogham inscriptions), this find is much farther west than the other known Ogham inscriptions in Cornwall and Devon (ancient Dumnonia). 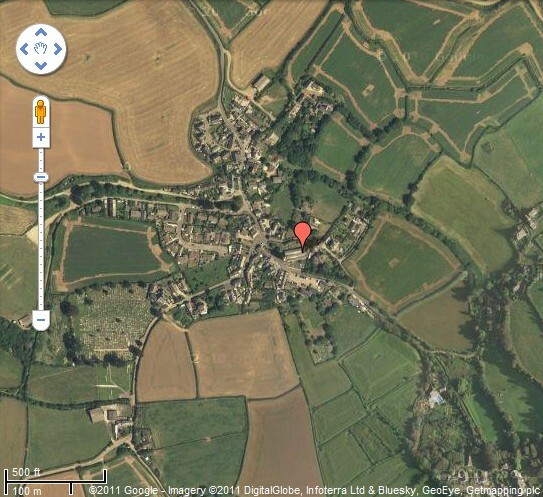 The fact that no Ogham stones have been found in this part of Cornwall previously is perhaps not particularly significant, and may just reflect the random chance of archaeological preservation. Certainly the west of Cornwall was as much (if not more) open to Irish influence than the east of Corwall was (St Ives is named after the Irish missionary Saint Ia, and St Erth is named after the Irish missionary Saint Erc). What may be significant is that the stone was found in a field near an ancient church, as very many Ogham stones in Wales and Cornwall are located in churchyards or churches (often built into the structure of the church). 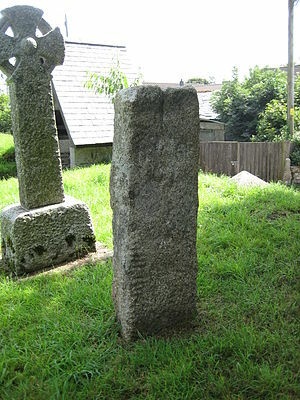 In some cases Ogham stones have been moved to the local church from their original location elsewhere, but in most cases it seems likely that they were originally set up in or near churches as memorials for the dead or as grave markers (the Cornish Ogham stones of Ulcagnus and Latinus also have Latin inscriptions reading hic iacit ... "here lies [the body of] ..."). But if Ogham stones are naturally found in churches and churchyards, why was this fragmentary Ogham stone found some distance from the nearby church? My suspicion is that the stone would originally have been located in the churchyard, but at some time (medieval or post-medieval) the strange and unreadable Ogham inscription could have been denounced as the writing of the devil, and the stone broken up and thrown out into the fields. Other Ogham stones in churchyards (such as the two examples at Lewannick) could have escaped this fate because they also had a parallel Latin inscription, which would have made them seem less suspect (on the other hand, the St Kew Ogham stone, which has parallel Ogham and Latin inscriptions, was found in a stream near the church, and so may have been thrown out of the holy ground irrespective of its Latin inscription). The stone itself is a small fragment (about 13 × 8 cm) of what must originally have been a much larger stone. The inscription is only a tantalizing fragment comprising a few letters that breaks off at both ends. The break at one end is still fresh, and was presumably made during recent ploughing. At least the piece of stone broken off at the freshly broken edge must still be somewhere in the field, but as yet it has not been found. Although the inscription is too fragmentary to make out much of a reading, it has several interesting features. First and foremost, the Ogham inscription is not written along the edge (arris) of the stone, using the edge as a natural stemline, as is the case in the vast majority of Ogham inscriptions, but is inscribed upon the face of the stone using two artificial stemlines. Ogham stones with inscriptions on the face of the stone (known as "scholastic" inscriptions) have traditionally been considered to be of a later date than the classical edge-inscribed Ogham stones (4th - 8th centuries). However, I am beginning to doubt that surface-inscribed Ogham stones are necessarily later in date than edge-inscribed Ogham stones. 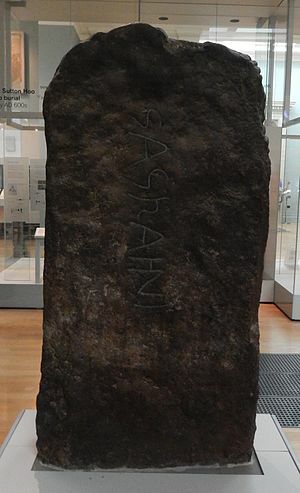 The Silchester Ogham Stone, which has been dated to the period 350-425, has a surface-inscribed Ogham inscription; and although in this case the surface inscription was probably not a matter of choice but of necessity as the pre-existing Roman column on which the inscription was made had no angular edges, it still proves that inscriptions on artificial stemlines could and did occur at a very early date. Coincidentally, the previous Ogham stone discovery that I am aware of, a small slate slab that was unearthed from a site on the Isle of Man during Summer 2006 for an episode of Time Team, is also a surface-inscribed Ogham stone. Significantly, to my mind, both the Penwith stone and the Isle of Man stone are composed of slate, so perhaps the flakiness of slate means that it is less suitable for inscribing Ogham along the edge: notching the strokes of the Ogham letters along the edge of slate might cause the edge to crumble and the Ogham letters fall apart (an experiment needs to be carried out). Thus it is possible that the surface inscriptions of the Isle of Man and Penwith Ogham stones are more a reflection of the stone used rather than their date. The five supplementary letters (Forfeda) only occur rarely on Ogham stone inscriptions, where they mostly represent sounds not present in Primitive Irish, and for which there was no basic Ogham letter. Medieval scholars later repurposed these five letters to represent a series of diphthongs. NEWT/1 (Newton, Aberdeenshire) : this inscription is difficult to read, and the letter in question is either read as 'K' in Irish koi or 'P' in Pictish ipo "nephew"
Given the relatively frequent occurence of the letter Éabhadh, it is possible that the V-shaped letter on the Penwith stone is a malformed or damaged form of this letter, especially as the two diagonal strokes do slightly cross the stemline, looking as if they could extend across and form an X-shape. Without having examined the stone in hand, I cannot be sure that the two diagonal strokes forming one half of the X have not been lost by damage to the stone, but the photograph that I have does not appear to show any signs of damage. Thus I am reluctant to interpret the strokes as representing the letter Éabhadh. There is also no precedent for a southern British Ogham stone using the letter Éabhadh, either as a consonant or as a vowel: all the certain consonantal occurences are restricted to Ireland, and all the vocallic occurences are limited to Ireland and the far north of Scotland. A further argument against this letter is the fact that as a consonant it almost always occurs in the word koi, which is almost always preceded by a personal name ending in a vowel, and thus the letter Éabhadh representing /k/ is almost always preceded by and followed by a vowel letter; but in the Penwith stone the letter above it is clearly not a vowel (two horizontal strokes). It is also unlikely to be vocallic letter Éabhadh, as vocallic usage of the letter is typical of relatively late inscriptions, and the Dumnonian Ogham stones are all fairly early in date. So all in all, I am doubtful that the V-shaped letter is the letter Éabhadh. As can be seen from the above three inscriptions, the Ogham letter Ifin representing /p/ was simplified from its later manuscript glyph form ᚘ (two overlapping diagonal crosses) to either an X-shape or a V-shape with a vertical line between the two diagonal strokes. I believe that the V-shaped letter in the Penwith inscription may well be a variant form of this same letter. The bottom of the lefthand stem also shows two partial, converging diagonal strokes, and these may also represent the same letter P (in this case it looks as if the two strokes would cross before reaching the stemline, thus making an X-shape to the side of the stemline, which would be the more correct way of writing the letter). 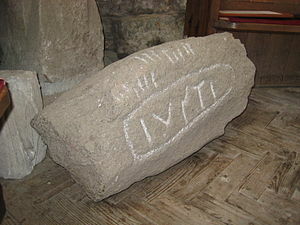 As the letter Ifin is used in two Welsh inscriptions for representing the letter P in Latin names, and as three out of the six other Ogham stones from Cornwall and Devon comemmorate people with Latin names (Ingenuus, Iustus and Latinus), it does not seem unreasonable to suppose that the Penwith stone might comemmorate someone with a Latin name, and if that Latin name was spelled with the letter P, then the Ogham letter Ifin would be required to represent it in the Ogham version of his name. Therefore, I interpret the V-shaped letter on the Penwith stone as the letter Ifin representing a /p/ sound. 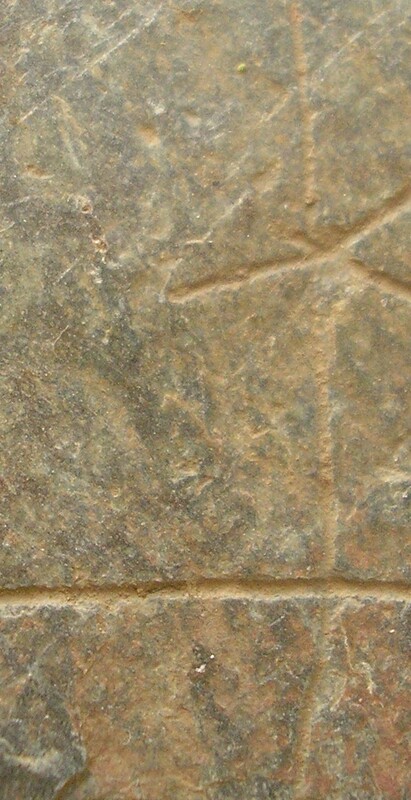 As the letter Ifin ᚘ protrudes to the right of a vertical stemline, we can use this letter to orientate the stone (in the orientation shown in the picture above, which is rotated 90 degrees clockwise from the original photograph), and thence know how to read the other Ogham strokes on the stone. There are two or possibly three parallel stemlines on this fragment, and on the basis of the Silchester Ogham Stone which has two parallel stemlines that read bottom-to-top from left to right, I assume that the stemlines on the Penwith stone should be read left to right. the four horizontal strokes protruding to the right form the letter S.
the two horizontal strokes protruding to the right form the letter L/F/S/N depending upon how many following strokes have been lost (because only the letter L would naturally follow the letter P, I think that it is most likely to be the letter L). There is a third possible stemline to the left of the left stem line, with a single perpendicular crossing stroke that could conceivably be the letter A, but as the stemline is so close to the left stemline it may be the remains of an aborted inscription, or it may not be part of an Ogham inscription at all. For the time being, I shall ignore it. It's not much to go on, but if I had to guess I would suggest that the righthand stem shows the last three strokes of the last letter of Primitive Irish maqi ᚋᚐᚊᚔ "son of" followed by a Latin name beginning with Pl... ... but unless another piece of the stone is found we will never know for sure what the inscription originally said. The Ogham stone finder has kindly supplied my with some better quality images of the stone, which I reproduce below (at a reduced resolution). Extending the stemline down and extending the two diagonal strokes (click on the above image or click here to open in a new window) shows that the bottom right letter is formed as an X-shaped cross to the right of the stemline, which can only be the letter Ifin ᚘ representing a /p/ sound. The four horizontal strokes to the right of the stemline are probably the letter S ᚄ, but as the stone to the left of the stemline is broken off, they could conceivably be the vowel letter E ᚓ. 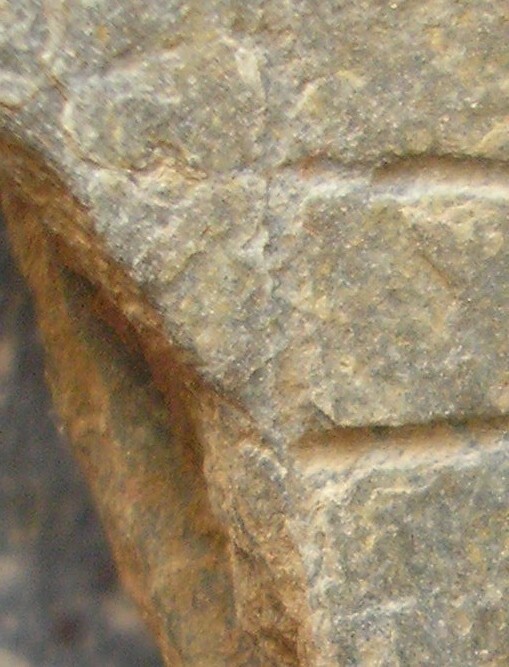 There appears to be a hint of a line to the left of the stem next to the topmost horizontal stroke, but at high resolution (see image below) this looks like a natural feature of the stone, and not a carved stroke. I am still very much uncertain about the two diagonal crossing strokes. They may be a badly carved letter Ifin representing a /p/ sound (open reconstruction in a new window), or they may be the letter Éabhadh ᚕ, representing a /k/ or /e/ sound, with the two diagonal strokes on the left of the stemline lost because of damage to the stone (open reconstruction in a new window). However, at high resolution (see image below) it is difficult to see any damage that would account for the loss of the two strokes to the left of the stem but not affect the adjacent left horizontal strokes. This appears to show a single vowel letter A, with the same assymetry as seen in Stemline B (vowel strokes are twice as long to the left of the stemline as they are to the right of the stemline). But as it is so close to the trailing end of Stemline A, and appears to have no adjacent letters, it is difficult to be sure whether it really is an Ogham letter or not. 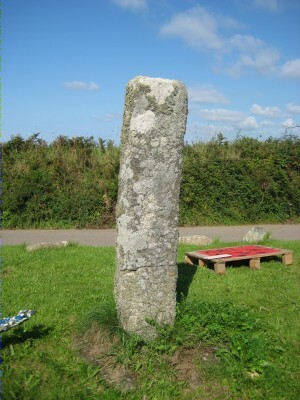 I can now disclose that the Penwith Ogham stone was found in a field near the parish church of St Pol-de-Leon in the village of Paul at the south-east corner of the Penwith peninsula. The church was reputedly founded by Paul Aurelian, a 6th century Welsh saint. The red tag indicates Paul Parish Church. The Penwith Ogham stone was found in a nearby field. The stone has now been confirmed as an Ogham stone by two leading oghamologists, Professor Charles Thomas and Dr Katherine Forsyth. 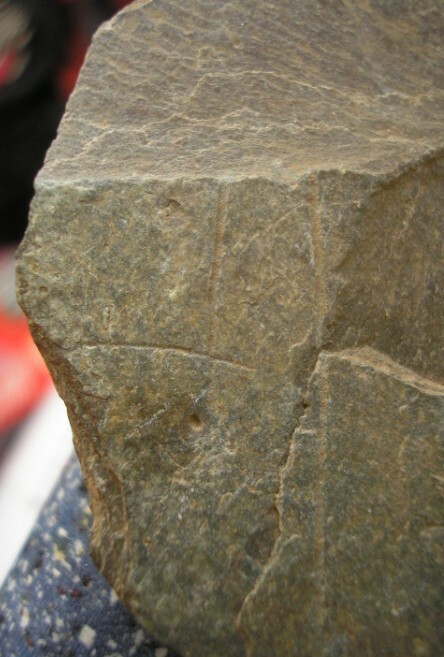 Forsyth, who notes that the V-shaped letter may be a "P", has described the stone as a "really significant find". 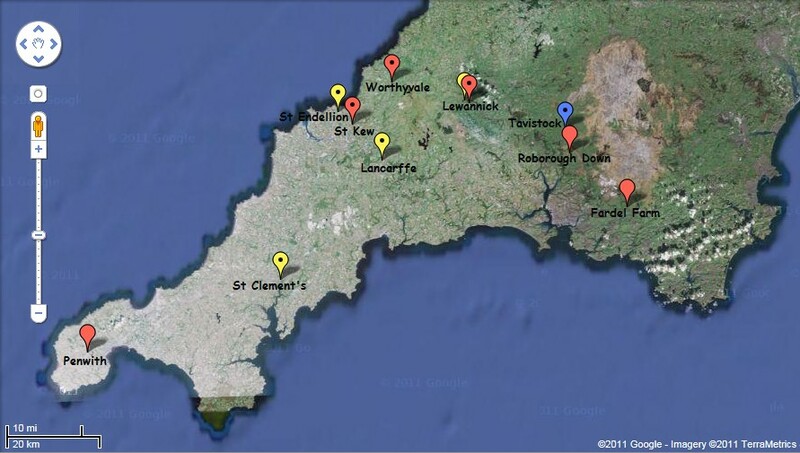 It is anticipated that a short article on the stone will be published in Cornish Archaeology. I have to admit to being very disappointed, and just a little frustrated, that the Cornish archaeologists have not been more proactive in investigating this stone, as it is potentially a very significant find of national importance. The fact that there is a fresh break on the stone indicates that there is at least one more surviving fragment of this memorial stone somewhere in the field where it was found. The small fragment that we have now is not enough to give a reading, or even to determine what language the inscription is in, but if the broken part of this stone (and/or other fragments of the memorial) were to be recovered then a reading may be possible. If I were a Cornish archaeologist I would have been jumping up and down in excitement, and would have started excavations and/or field walking in the find field at the very earliest opportunity in order to find more fragments of the memorial and to determine an archaeological context for the find before the evidence is further destroyed by ploughing. It is baffling to an amateur like myself that there seems to be no local archaeological interest in trying to recover more fragments of this highly unusual Ogham stone. It is also very strange that the local Finds Liaison Officer does not seem to consider this find important enough to add to the Portable Antiquities Scheme Database. All I can hope is that an archaeologist with an interest in early Cornish history takes up the cause of this stone, and that one day an Ogham monument reconstructed from several fragments will be on display in a museum in Cornwall. Ogham stones occur throughout the areas of Britain that border the Irish Sea, from Shetland and Orkney in the north, through Scotland, the Isle of Man and Wales, down to Devon and Cornwall in the south. 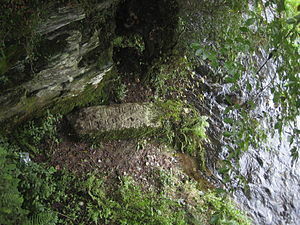 Perhaps suprisingly, there are no known Ogham stones from the area of Northern England between Wales and Scotland that up until the early medieval period was inhabited by a Brythonic-speaking people, or from Brittany, which was a destination for Irish missionaries such as Saint Colombanus. Less surprising is the fact that Ogham stones do not occur in those areas that are beyond the immediate sphere of Irish influence, and that are far from the well-travelled sea routes from Ireland to the west coast of Britain. Thus, outside of Cornwall and the far west of Devon, England is, with a single exception, devoid of any Ogham stones. This single exception is to date the only known certain example of an Ogham stone inscription from elsewhere than Ireland, Scotland, the Isle of Man, Wales or Dumnonia. 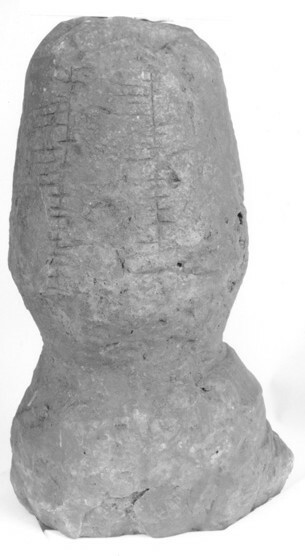 This unique Ogham stone was found in 1893 during the excavation of Silchester Roman Town in Hampshire, about 95 miles from the nearest other Ogham stone at Crickhowell in Powys. The vast majority of Irish Ogham inscriptions are carved along the vertical edges of a stone (using the edge as a natural stemline), but this example is unusual in that the inscription is written along two artificial stemlines running vertically up the face of the stone. Together with the fact that this Ogham stone is so distant from any other Ogham stone, this uncommon (but certainly not unkown) manner of carving the Ogham text has caused some to throw doubt on the authenticity of the inscription. But in the absence of any evidence that the Victorian gentlemen carrying out the 1893 excavation were cunning hoaxers, it seems unlikely to me that the inscription is not genuine; and the recent excavations appear to confirm this opinion (see M. Fulford, M. Handley and A. Clarke, "An early date for Ogham: the Silchester Ogham Stone rehabilitated" in Medieval Archaeology 44 (2000) : 1-23). The simple explanation would seem to be that Tebicatos came to inhabit an old Roman dwelling during the late Roman or early sub-Roman period, and that he or his comemmorators simply used a pre-existing Roman dwarf column to carve their message on, and as the column did not have any angular edges, the inscription had of necessity to be written on the face along artificial stemlines — I do not see anything suspicious about this scenario. As mentioned above, one possibility for why the inscription was made was that it marked ownership of the building, and that the inscription was carved onto the dwarf column in situ, whilst still a functioning architectural feature of the house. However, it seems unlikely to me that in a Roman town, with presumably very few other Irish inhabitants, Tebicatos would publicly mark ownership of his house in a script and language that almost none of the town's other inhabitants could read. Welsh and Dumnonian Ogham stones are almost exclusively memorial stones (often with an accompanying hic iacit inscription in Latin), and thus I think that the Silchester Ogham stone would have been set up as a memorial to Tebicatos on his death, perhaps utilising a column from an abandonned or derelict building. It is much more plausible that a memorial stone would use a script and language that Romans and Romanized Britons could not read, as memorial stones are more ritualistic in function than utilitarian — it would not matter if the Romans and Britons could not understand the inscription, just so long as the spirit of Tebicatos could. The Ogham inscription is linguistically quite typical of Irish Ogham stone inscriptions, being written in standard Primitive Irish, and reading TEBICATOS MAQI MUCOI [...] "Of Tebicatos, son of the tribe of ..." (or "Of Tebicatos, son of the descendant of ..."). Unfortunately the name of his ancestral tribe has been lost at the top of the righthand stem. However, the name Tebicatos appears to be British (Brythonic) rather than Irish (Goidelic). Although the initial element Teb- is of uncertain meaning, it is paralleled in the name of Tibatto, leader of the Bacaudae in Farther Gaul, who led a rebellion in 435-437; and it may also be related to the medial element in the names Vortipor and Votiporigis. The final element -catos means 'battle" (Old Irish cath, Old Welsh cat), and is attested in names such as Ambicatos 'having battle around himself', son of Rocatos (ANDRS/1), and Ambigatos, king of the Bituriges in central Gaul. Perhaps Tebicatos was an Irish immigrant who adopted a British name (or Brythonifed his original name) or perhaps he was the member of an Irish family who was born in Silchester and so had a British name. 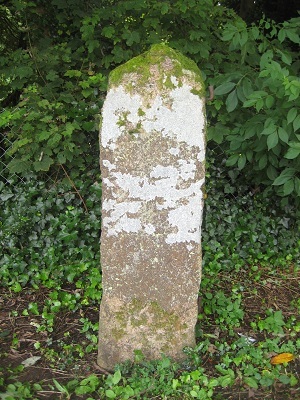 After having first published this post, it came to my attention that there is one more purported English Ogham stone, discovered by a Victorian antiquarian and amateur archaeologist, Francis Redfern, in 1870 at Uttoxeter in Staffordshire, about 65 miles from the nearest Welsh Ogham stone at Clocaenog in Denbighshire. 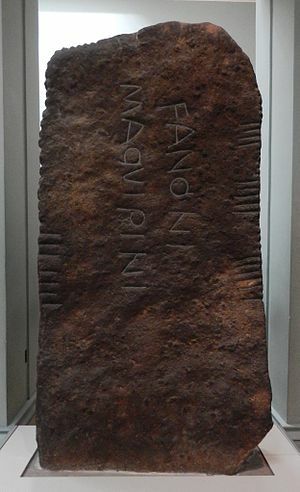 The Ogham inscription is said to have been carved on a piece of Roman millstone made from volcanic rock from Andernach in Germany, found in the mud surrounding a well near to a possible Roman fort and Roman road. The stone is now lost, and as Redfern does not seem to have published a drawing of the stone or its inscription, it is difficult to make a judgement about the authenticity of the inscription. However, it does have interesting parallels with the Silchester stone — both inscriptions are carved on stone objects leftover from Roman usage rather than on natural stones, and both stones were found in or by wells in Roman settlements. If the Silchester stone is an outlier of the Irish Kingdom of Brycheiniog in south-east Wales, then the Uttoxeter stone can be seen as an outlier from the even closer north Welsh Kingdom of Gwynedd. Site Silchester Roman Town, Hampshire. Current Location Reading Museum [1995.1.24]. History Discovered in 1893, upsidedown at the bottom of a well by the west end of the southern corridor of House 1, Insula IX. Description Roman dwarf column made of greensand, with two parallel vertical Ogham inscriptions on one side. Dimensions 0.60 × 0.36 × 0.36 m.
Notes The inscription is carved along artificial stemlines on the surface of the stone because the column does not have any sharp edges. Notes The reading of Tebicatos is based on Handley 1999; Macalister 1945 reads the name as Ebicatos. Site Maiden's Well, Uttoxeter, Staffordshire. History Discovered in 1870 by Francis Redfern, in the mud by a well. Description Fragment of a millstone made from volcanic stone (tuff) from Andernach. "The fosse way [Icknield Street] which I have traced over the High Wood passed by the remain; and Maiden's Well, although most likely of Celtic date, would be resorted to by the cohort of the camp. From the mud about this well I have recovered a piece of a Runic stone of a tuberous and dark character, with ogham characters on it." (Redfern 1873 page 270). "In 1870 I found what proves to be an interesting relic in the vicinity of Maiden's Wall Well, on Uttoxeter High Wood. Before attempting to introduce any notice of the object in these pages, I submitted it to the inspection of three gentlemen for for their opinion upon it. Mr. Fradgley, architect, and the late Mr. Lucas, of Bentley Hall, deemed it to be of great antiquity, and the Rev. Mr. Kerry, of Puttenham, has not hesitated to declare it to be a portion of a Runic stone bearing Ogham characters. The stone itself is a piece of sonorous and dark tuff, probably from Andernach on the Rhine. Ogham letters are merely straight strokes arranged in groups along a line, as in the instance on this fragment, and mostly contain the name of the person in whose honour such stones were erected." (Redfern 1886 page 47). Redfern 1873 : Francis Redfern, "On Uttoxeter and the Archæological Remains of the Parish and Neighbourhood"; in Journal of the British Archaeological Association vol.29 (1873) pages 263–278. Redfern 1886 : Francis Redfern, History and Antiquities of the Town and Neighbourhood of Uttoxeter (2nd ed.). London, 1886. In anticipation of next week's blog post, I thought it would be useful to present a brief survey of the known Ogham stone inscriptions in Cornwall and Devon. Although the large majority of Ogham stones are found in Ireland, a number of Ogham stone inscriptions are known from Scotland, the Isle of Man, Wales, and the south-west peninsula of England (the modern counties of Cornwall and Devon), as well as a single outlier at Silchester in Hampshire. At the time that most Ogham inscriptions were made (5th century through 8th century C.E. ), the south-west peninsula was occupied by the British Celtic kingdom of Dumnonia, but there were strong trading and religious ties between Dumnonia and Ireland which might explain the presence of a small number of monumental stones with Ogham inscriptions (seven certain inscriptions marked with red tags and another five dubious or unconfirmed inscriptions marked with yellow tags). 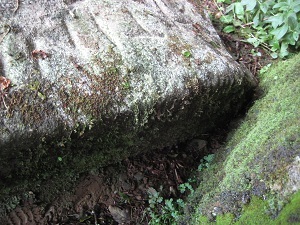 It is likely that these are all that remain of a larger number of Ogham-inscribed stones in the region, but as Ogham letters along the edge of stones are easily eroded (more so than a Latin inscription on the face of the stone), some stones that now show no trace of an Ogham inscription may originally have have had one. 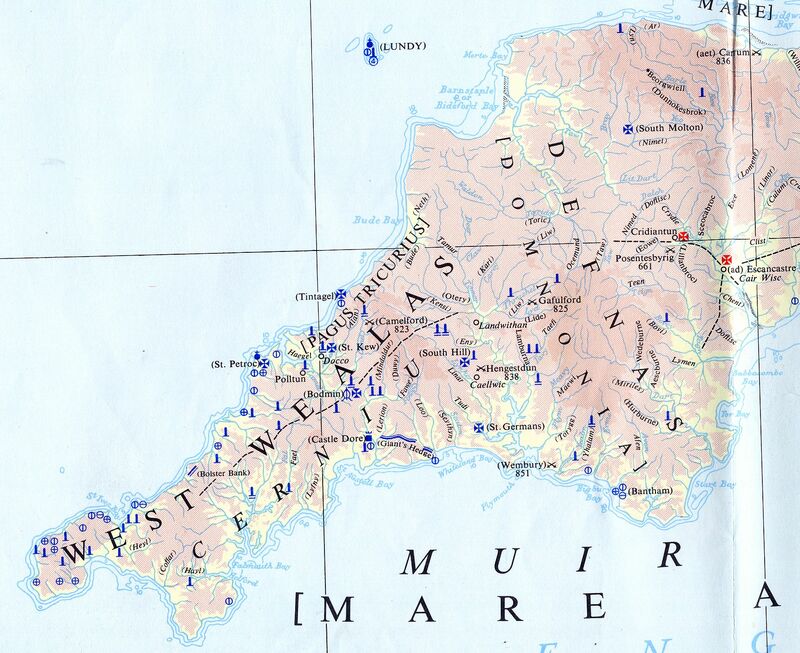 As can be seen from the map, the stones are mostly found in a band running from north-east Cornwall down to south-west Devon. It is possible that this distribution reflects secondary migration of Irish settlers from South Wales, in particular from the Kingdom of Dyfed (modern Pembrokeshire), where a large number of Ogham stones were erected by Irish settlers. Three of the certain Ogham inscriptions are sited in churches or churchyards, one of which (St Kew) was only moved to the churchyard after it was discovered in a nearby stream. Maybe coincidentally, two of the other three stones, that are not sited by a church, are also associated with water; one is sited on the bank of a river, and the other (now in the British Museum) was originally being used as a culvert across a stream. A fragment of an Ogham stone found in the Penwith peninsula in autumn 2009 is by far the most westerly example of a Dumnonian Ogham stone. It is also very unusual in that the Ogham inscription is carved on the face of the stone on two artificial stemlines, rather than along the edge of the stone as is the case with the other Ogham stones from Cornwall and Devon (and also the vast majority of Ogham stones elsewhere). There is also no evidence of a parallel Latin inscription on the fragment. This stone is discussed in more detail at The Penwith Ogham Stone. TVST3/1 : DOBVNNI = Dobunnus (Goidelic? ♂) maybe from Pr.Ir. *dubu 'black' + ? The mixed Irish/Latin nature of the Dumnonian Ogham stones can perhaps best be explained as being due to the Irish immigrants being in a small minority in the Brythonic communities that they settled in, and so they had their commemoration stones inscribed in Latin (the lingua franca of the time) for the benefit of the local inhabitants, and also in Ogham in recogntion of their own cultural heritage. The TVST3/1 stone is particularly interesting in this respect, as it seems to commemorate a father and a son in two inscriptions, the father being commemorated by a simple Ogham inscription, and his son being commemorated by a much longer Latin inscription that records his occupation as a smith. This suggests that perhaps Enabarras was a first-generation Irish immigrant, but that his son Dobunnus had become Romanized, and no longer considered Irish to be his main language. The Latin names Ingenuus, Iustus and Latinus may also reflect a process of cultural acclimatization, whereby second or third generation Irish immigrants rejected the generally hypocoristic names used by their forefathers, and adopted more "civilized" Latin names. Ogham stones are notoriously difficult to date accurately, as they normally lack any archaeological context, and because Ogham letters lack the sophistication of Latin letters it is usually hard to date them on epigraphic grounds. The Dumnonian examples have the advantage of having parallel Latin inscriptions, but even so it is hard to be certain when the stones were carved. Thomas (1994) dates them all to the 5th century, whereas Okasha (1993) dates them to any time within the 5th to the 8th centuries. My personal feeling is that the adoption of Latin names by many of those comemmorated on the stones suggests a date that is closer to the Roman period than to the Anglo-Saxon period, so I think a 5th century to 6th century date for the inscriptions is most likely, which would make them contemporaneous with the Ogham stones of South Wales. Site St Martin's Church, Lewannick, Cornwall. Current Location In the churchyard, a few metres west of the lych-gate. History Discovered in 1892 by A. G. Langdon, buried on the south side of the churchyard. Description Pillar stone of reddish granite with horizontal Latin inscription in four lines, and Ogham inscription running up left edge. Dimensions 1.22 × 0.40 × 0.23 m.
Notes Viewed 27 August 2010. The stone is situated to the left of the lych gate on the south side of the churchyard. The Latin inscription is extremely worn, and I could not make out any letters with certainty. The Ogham inscription is also very worn, and the top part cannot be made out at all. 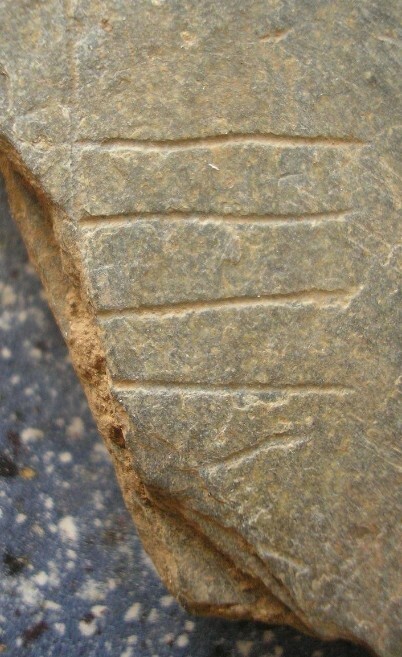 Oddly, the lower part of the Ogham inscription, which Macalister drew with dotted lines, is relatively clear, and the letters "G", "N" and "V" of "IGENAVI" can be read. The "I" at the start of the Ogham inscription is now hidden beneath the surface. Current Location Inside the church, at the north end. History Discovered in 1894 by F. H. Nicholls, in two pieces, built into the walls of the north porch of the church. Description Pillar stone, now in two pieces, with one end missing, with Latin inscription running vertically, and Ogham inscriptions on the left and right edges. Dimensions 1.50 × 0.34 × 0.28 m.
Viewed 27 August 2010. The stone is situated on the north side of the west end of the church. The Latin and Ogham inscriptions are both very clear and legible, and were highlighted with charcoal. The Ogham inscription on the right edge is only partially visible as the right side of the stone is against the wall. There are two unusual features of the inscriptions. Firstly, the Latin and Ogham inscriptions have the same orientation (both apparently reading vertically top-to-bottom or bottom-to-top). Secondly, the Ogham inscription is carved twice, once correctly as ULCAGNI (matching the VLCAGNI in the Latin inscription) and once incorrectly as UDSGQI (with the strokes of the letters L, C and N branching off to the wrong side of the stem, transforming them into the letters D, S and Q repectively). My hypothesis is that the stone was carved before it had been erected, by two different masons, one working on the Ogham inscription, and one working on the Latin inscription, and that they each thought a different end of the stone was the base. The Ogham inscription of the name Ulcagni was originally carved up what the mason assumed to be the left edge of the stone, as is normal, but because he accidentally carved the strokes of the letters L, C and N on the wrong side of the stem, he recarved the name correctly up the right edge of the stone; then when a different mason (who perhaps could not read Ogham) came to carve the Latin inscription, he assumed that the end of of the stone that the Ogham inscription starts at was the head of the stone, and carved his inscription down the stone from that end, with the result that if the stone is oriented with the Latin inscription reading downwards, as is normal, then the Ogham inscriptions appear to also read downwards (ULCAGNI down the left edge and UDSGQI down the right edge), which is abnormal. As the stone does not stand in situ, and is in quite bad condition (broken into two pieces), it is not evident which way up the stone originally stood, but my feeling is that it would have been more legible to have the Ogham inscriptions oriented correctly (UDSGQI reading up the left edge and ULCAGNI reading up the right edge) and the Latin inscription misoriented (reading vertically up from the base). This orientation is shown in the drawing from Macalister 1945 shown below. History Discovered c.1912 by Frank H. Nicholls in a field south of Polyphant Quarry. Nicholls moved the stone to his garden, 'Moor View', in Lewannick [SX 2748 8082], but it was no longer in the garden in 1974 (and not known by the then owner, who had lived there since 1931). Description Pillar stone with inscribed marks along left edge and on the top of the front face. Notes This stone is listed in Thomas 1994 p.333, but with few details and no reading for the purported Ogham inscription. A drawing of the stone is given in Plate 3 of "On Some Antiquities at Lewannick, Cornwall" by Frank Nicholls and Henry Dewey in Journal of the Royal Institution of Cornwall vol. 19 part 1 (1912). From the drawing the marks do not appear to me to be an Ogham inscription. Site St James' Church, St Kew, Cornwall. Current Location Inside the church, at the west end. History Discovered in 1924 by Rev. H. Dalton Jackson in the bed of a stream near St James' Church. Description Granite pillar stone, broken at both ends, with a vertical Latin inscription in a cartouche, and an Ogham inscription on the left edge. Dimensions 0.72 × 0.37 × 0.39 m.
Viewed 27 August 2010. The stone is situated on the south side of the west end of the church, lying on its side on the floor. The Latin and Ogham inscriptions are both very clear and legible, and were highlighted with chalk. The Latin and Ogham inscriptions unusually have the same orientation, and so one of them must have been oriented contrary to normal practice when the stone was erect. I assume that the Ogham inscription would have been written top-to-bottom up the left edge, as is normal for short inscriptions, in which case the Latin inscription must have been written reading vertically up the stone, which is odd, but not as odd as a single line of Ogham being written top-to-bottom down one of the edges. Current Location About 100 m upstream from Slaughter Bridge, on the left bank of the River Camel. Access via The Arthurian Centre (entrance fees apply). History First recorded by Richard Carew (1555–1620) in his Survey of Cornwall (1602) (see quotation below). William Borlase (1696–1772) records in his Antiquities of Cornwall (1754) that the stone was formerly used as a footbridge over the Camel, but Lady Falmouth moved the stone to a grotto at the foot of a nearby landscaped hill. By 1799 the stone was at its current position on the bank of the Camel (see The Gentleman's Magazine, and Historical Chronicle vol. 69 part 2 page 571). Description Large pillar stone with vertical Latin inscription in two lines, and Ogham inscription at the top end of the right edge. Dimensions 2.06 × 0.70 × 0.37 m.
Viewed 27 August 2010. The stone is situated on the west bank of the River Camel, about 100 metres upstream from the B3314 road bridge at Slaughter Bridge. Access is only via the Arthurian Centre (Adults £3.50, Concessions £3.00, Family ticket £ 10.00): follow the trail to "King Arthur's Stone", which can be viewed from a wooden viewing platform above the river. The stone is lying flat, with the Latin inscription facing up, on an easily flooded shelf between the river and a rock cliff below the viewing platform. The Latin inscription is in good condition, and is quite legible, except for the middle two letters and last letter of "MAGARI", and the final letter of "IACIT". The Ogham inscription is very worn, and only the "I" of "LATINI" can still be easily recognised. Known as "King Arthur's stone". Richard Carew, Survey of Cornwall (1602) page 122b records : "Vpon the riuer of Camel, neere to Camelford, was that laſt diſmal battel ſtrooken betweene the noble king Arthur, and his treacherous nephew Mordred, wherein the one took his death, and the other his deaths wound. For teſtimony whereof, the olde folke thereabouts will ſhew you a ſtone, bearing Arthurs name, though now depraued to Atry." Notes Macalister 1945 reads 'Magari'; Thomas 1994 reads 'Macari'. Site Lancarffe House, Helland, Cornwall. Current Location Built into the wall of a summer house in the garden of Lancarffe House. History Discovered in 1912 by Mr Dunn in a stream near Lancarffe House. In 1928 a neighbour removed it to a garden in Bodmin without permission, but Mr Dunn recovered the stone, and built it into a garden wall for security. 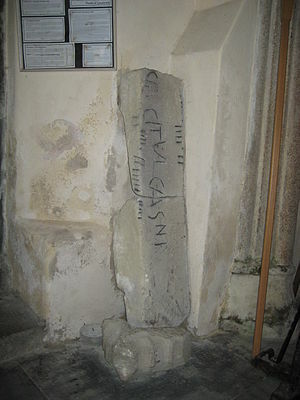 Description Pillar stone with vertical Latin inscription in two lines. 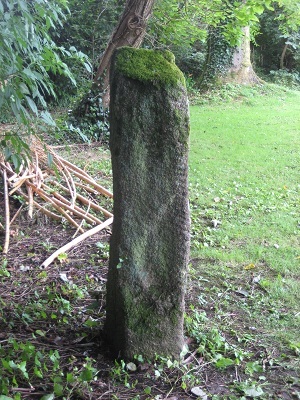 Dimensions 1.87 × 0.25 × 0.04 m.
Notes Marked as an Ogham stone on the Ordnance Survey Map of Britain in the Dark Ages, but no Ogham inscription is noted in the CISP database, or shown in the drawing of the inscription in Macalister 1945. Notes Thomas 1994 reads 'Mescagni'; Macalister 1945 reads 'Mercagni'. Current Location On a grass island at a junction about 1.5 km from St Endellion on the road to Port Quin. History First recorded in 1753 by James Tregeare in a manuscript account of the Parish of Endellion which was sent to William Borlase (1696–1772) for use in his anticipated but never published Parochial History of Cornwall. Sometime between 1821 and 1873 the stone was moved to Doyden Head near Port Quin, where it was subject to severe weathering, but in 1932 it was bought back to its original location by the road between Roscarrock and St Endellion Church, where it still stands. Description Granite pillar stone with a chi-rho cross at top, and a vertical Latin inscription in two lines. Dimensions 1.49 × 0.31 × 0.21 m.
Viewed 27 August 2010. The stone is erected in the middle of a grass island at a junction on the road between St Endellion and Port Quin. The stone is heavily worn and covered with lichen, and I could see no trace of either the chi-rho cross or the Latin inscription. There was also no evidence of an Ogham inscription. Either I was looking at the wrong stone or its condition has deteriorated severely since it was examined by Okasha and Thomas in the early 1990s. The putative Ogham inscription is extremely doubtful: "There seemed to me to be faint and doubtful traces of Ogham—but nothing that could be regarded with any confidence" (Macalister 1945 p.457); "There is no sign of any ogham text today and in my view this can be disregarded" (Okasha 1993 p.23). Site St Clement's Church, St Clement, Cornwall. Current Location In the churchyard, near the south door. History First recorded by William Borlase (1696–1772) in his Antiquities of Cornwall (1754), when it was being used as a gatepost in a field west of the church (later part of the vicarage garden). It was erected in the churchyard in 1938. Description Granite cross stone with a vertical Latin inscription. Dimensions 2.26 × 0.40 × 0.37 m.
Notes The Ogham inscription is very doubtful. 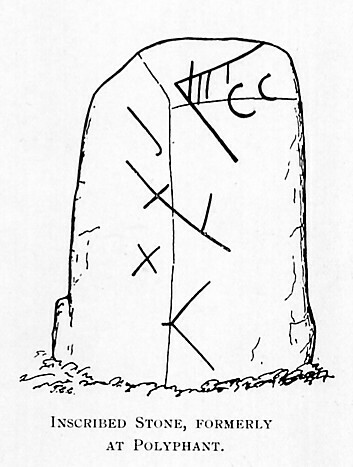 It is marked as an Ogham stone on the Ordnance Survey Map of Britain in the Dark Ages, and Macalister 1945 shows a reconstructed Ogham inscription along the damaged edges of the stone (where he presumably believed that the Ogham inscription had been deliberately excised), but the CISP database makes no mention of an Ogham inscription on this stone. Notes Possibly "...igni" plus "oc" for "hic". Site Paul Parish Church, Paul, Penwith, Cornwall. Current Location In private ownership. History Found in a newly ploughed field near Paul parish church in November 2009. Description Fragment of a slate slab, with one end freshly broken. 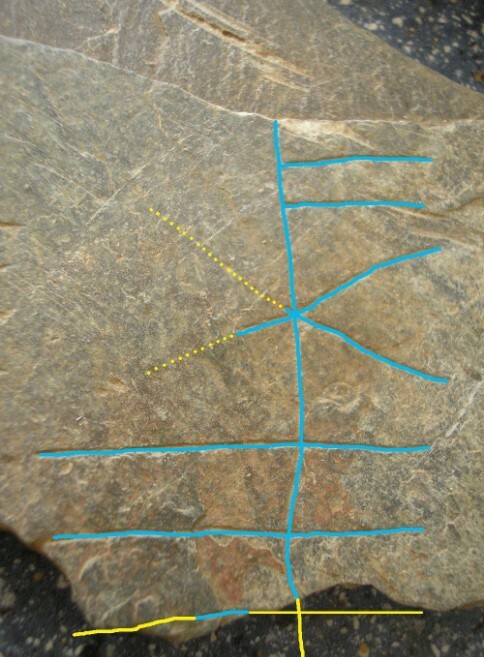 Two or three artificial stemlines are engraved parallel to each other on the surface of the stone. Dimensions 0.13 × 0.08 m.
Notes The inscription is very incomplete, with just fragments of five or six letters remaining. 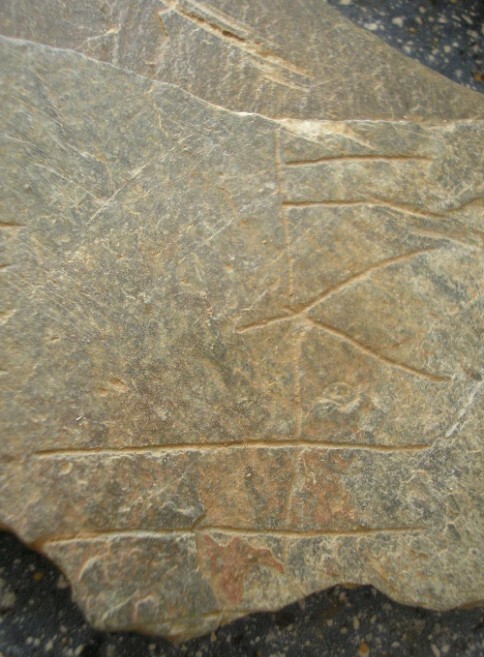 The inscription on the flat surface of the stone is very unusual, although it is normal in Pictish Ogham inscriptions from Scotland to be carved on the surface of the stone, and an Ogham inscription carved on the flat surface of a piece of slate that is datable on archaeological evidence to 540–650 was discovered on the Isle of Man in 2007 (see Speke Farm Keeill Stone). Notes Transcription by Andrew West. There is possibly a third stemline on the top left, with a single letter A. The inscription is too fragmentary to attempt a definite reading, but the three vowel strokes of the first letter on the right stemline could conceivably be the remains of the letter i from the Primitive Irish word maqi "son of", and the following two letters could be the start of a Latin name beginning with Pl..., i.e. [--] [MAQ]I PL[--] = "..., son of Pl[...us]". Site Roborough Down, Buckland Monachorum, Devon. Current Location Tavistock Vicarage Garden. History Discovered by Rev. E. A. Bray in 1834, when it was being used as a gatepost to a field on Roborough Down. The landowner refused Bray's request to remove it to his garden at Tavistock vicarage, but in 1868 (Francis Charles) Hastings Russell (1819–1891) had the stone taken to Tavistock Vicarage Garden. Description Pillar stone with a vertical Latin inscription in three lines, and an Ogham inscription on the left edge. Dimensions 1.52 × 0.43 × 0.30 m.
Notes Viewed 14 August 2012. Located in the private garden of the vicarage at Tavistock, together with TVST1/1 (photo) and TVST2/1 (photo). Viewed by kind permission of Rev. Michael Brierley. The Latin inscription is extremely weathered, and at first sight there appears to be no inscription at all on the front of the stone. However, with a little imagination and prior knowledge of what is supposed to be inscribed there, most of the letters can just about be recognised, although I would have found it impossible to make a reading unaided. The Ogham inscription on the left edge is in much better condition, and the last five letters of "ENABARR" can still be recognised quite easily (the letters "ABA" are particularly distinct on close examination). Site Fardel Farm, Cornwood, Devon. Current Location British Museum [1861,0209.1] (G41/s6). History Discovered by Rev. Samuel Pearse of Cadleigh, who as a boy in the late 18th century had noticed the inscribed stone in use as a part of a culvert over the Fardel Brook crossing the road between Ivybridge and Fardel. In about 1860 Pearse had the stone removed to the farmyard at Fardel, and in 1861 the farm's owner, Captain Pode, donated the stone to the British Museum. Description Pillar stone in red sandstone with a vertical Latin inscription and an Ogham inscription on the left and right edges. Dimensions 1.68 × 0.87 × 0.25 m.
Notes Viewed 14 August 2012, on display at the British Museum. Notes These may also be two independent inscriptions, SAFAQQUCI "Of Safaqqucus" and MAQIQICI "Of Maqiqicus" or "Of the son of Qicus". Current Location Set into the base of a field wall on the north side of the track from Cheriton to Hoaroak. History Identified as an Ogham stone by "Pearce" (Susan M. Pearce, author of The Kingdom of Dumnonia: studies in history and tradition in south-western Britain, A.D. 350-1150 (1978) ?). Description Large stone with linear scratches on its south face and west edge. 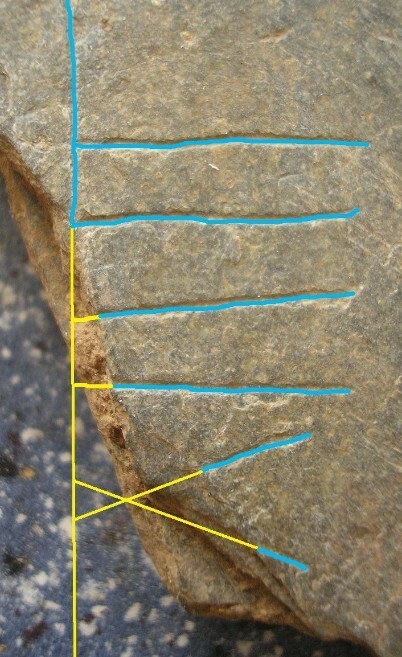 Dimensions 1.10 × 0.70 × 0.20 m.
Notes There are linear scratches on two edges of this stone, but these are probably not an Ogham inscription, but marks made by ploughing before the stone was built into the wall. Langdon & Allen 1895 : A. G. Langdon and J. R. Allen, "Catalogue of the Early Christian Inscribed Monuments in Cornwall"; Archaeologia Cambrensis 5th series vol.12 (1895) pages 50–60.